You will enjoy cotton flannel fabric when you wear Wade Wilson Jacket. Internally snug white shearling lining is present to increase the comforts. Red color dress with checkered black designing is a perfect choice of fashion lovers. White fur notch collar increased the beauty on red shade. Deadpool Coat has two large pockets on front with shearling white edge. Front corsage is given through zip. Both sleeves are long and have normal fitting. White stripes are present on both shoulders. Deadpool Flannel Jacket has white fur stripe on back. Open hem cuffs are the end of sleeves. I cannot express how wonderful made this jacket. Fits very well. Very impressed. Very Happy with the purchase from here! Nice coat! !! Just like the pictures! !! Compliments all the time !!!! The Large fits me perfect. The fabric is totally amazing and it looks great. I am very surprised and very happy with the purchase. Very good fabric and look. I really recommend. 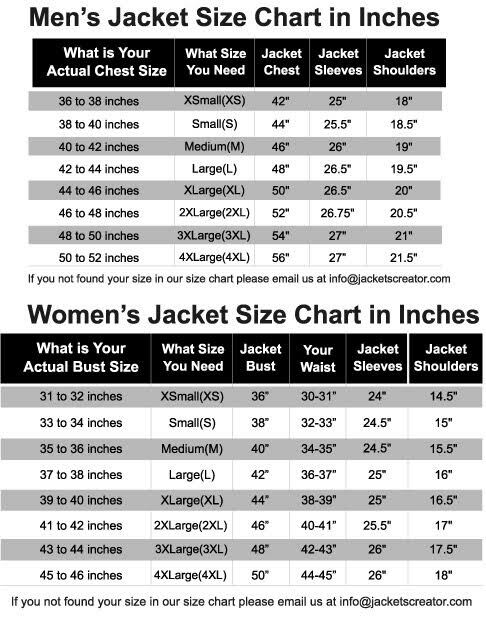 The size guide is very accurate. It’s a great jacket in this price!